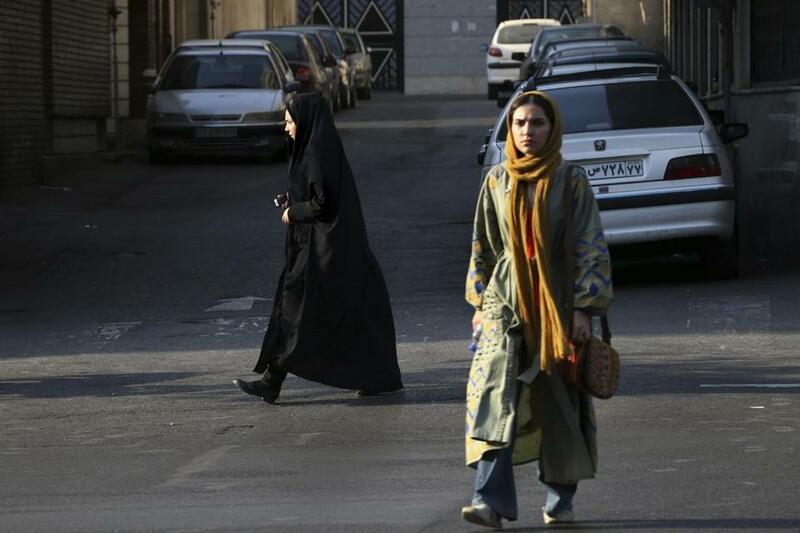 Two Iranian women made their way across a square in downtown Tehran. TEHRAN — Climbing atop a 5-foot-tall utility box in one of Tehran’s busiest squares Monday, an Iranian woman removed her head scarf, tied it to a stick, and waved it for all to see. It was no small feat in Iran, where women can be arrested for publicly flouting the Islamic requirement that they cover their hair. She was not alone. On Monday several other women, a total of six, according to social media accounts, made the same symbolic gesture: taking off their head scarves in public and waving them on a stick, emulating a young woman who climbed on the same sort of utility box on Dec. 27 and was subsequently arrested. Activists say she has since been released, but she has still has not resurfaced in public. Alinejad has reached out to Iranian women on Persian-language satellite television and through social media, where she runs a website called My Stealthy Freedom. On the website, women post images of themselves without head scarves, demanding an end to the compulsory head-scarf law. While discriminatory Islamic divorce and inheritance laws pose problems for individual women, the head scarf is a highly public symbol of a set of personal rules imposed by Iran’s clerical leaders, who decide what people can wear, what music they can listen to, and what television programs and movies they get to see. Men are also the subject of clothing laws: They are forbidden to wear shorts in public. During the past decade, influenced by the rise of the Internet, satellite television, and cheap foreign travel, many Iranians have grown deeply resentful of rules that they can see for themselves are out of step with most of the rest of the world. Many have become relatively secular and feel increasingly unwelcome in the fixed-in-stone state version of Shi’ite Islam, and many have taken to flouting the rules whenever and wherever they feel free enough to do so. Their removal was a gesture to a radically changed society, but it was also a recognition that there were not enough enforcers available to control a society that resents and rejects the rules. Women without head scarves can been seen everywhere in Tehran, in their cars, in shopping centers, and even on the street, but always with the scarves draped over their shoulders, as if they have only just slipped off.